Bring half the cream to just under the boil with the stem ginger and then blitz until very smooth. Pour back into a pan with the remaining cream and sugar and return to just under the boil – it’s important not to let the cream boil, reduce and thicken as this will cause the pannacotta’s texture to be heavy. Squeeze the gelatine dry and whisk it into the warm cream. Pass the mixture through a fine meshed sieve. Set the mixture in timbales, martini glasses, ramekins or directly into shallow moulds. 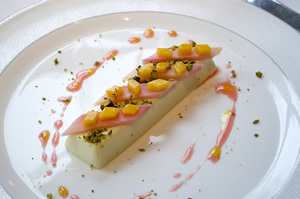 The pannacotta is ideally made the night before and left to set slowly in the fridge. If you’re in a hurry it will take at least four hours although it’s a little like kettles – a watched pannacotta never sets. Rinse the rhubarb well and remove the poisonous leaves if they’re still attached. Place the rhubarb in a wide pan (not aluminium) and cover with the poaching liquor, bring back to just under the boil and poach for 2-3 minutes until tender. Gently roast the pistachios in the oven at 170c until nicely toasted and browned with a pleasant aroma then leave to cool and roughly chop. Warm the moulds in a little hot water for about 10 seconds then carefully turn them out. Arrange the poached rhubarb and diced mango around and generously drizzle around the poaching liquor. At the last minute sprinkle over the chopped pistachios and serve immediately. Bergamot – the delicate perfumed flavour in Earl Grey tea, is available as a fresh citrus fruit in winter. At the restaurant we use it to add a subtle flavour to theYorkshirerhubarb by infusing the poaching liquor with the zest.